The Rainbow, essence of sunlight, separation element between a gray cloud and the blue sky after a storm or, if you will, the stillness after the storm Rainbow, its shades are universally recognized as colors of flags representing pacifists, environmentalists, Greenpeace, and gay people, Gay pride flag. 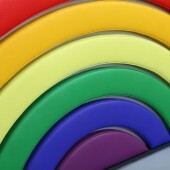 Rainbow, its elusive appearance always brings a cheerful thought, joy of life. Rainbow, it always comes into your mind, even when you take a pencil to start creating. It is the backrest, made as upholstery sculpture, that makes this Sofa different from all the others. The low relief gap between all the colored bands, visible seams and sharp corners emphasize quality and aesthetic output. the Sofa Rainbow is designed to be suitable for the entire Contract sector: offices; financial circles such as banks, stock exchanges, insurance, etc., commercial areas such as shops, showrooms and workshops; hospitality such as hotel lobbies and suites, cruise ships and yachting. The sofa backrest, element stylistically and structurally independent, could be a headboard simply removing it from the sofa to be replaced in a couch structure. 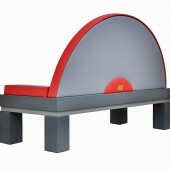 Similarly, the seat could live a second life as lounge table, just replacing the cushions with a glass base and rearranging the slot for the backrest a: 1.bottle or sprig carrier; 2.slot for a bioethanol fireplace; 3.slot for a TV; 4.slot for a waterfall wall similar to the Homedics Zen Wfl MWall. The idea was born in Sicily on February 2012. The prototype was realized in August 2012. In September 2012 the design is submitted to the UIBM, Ufficio Italiano Brevetti e Marchi ; Patents and Trademarks Italian Office. In December 2012 runs for the Frame Moooi Award 2013. The backrest is characterized by a rigid multilayer wood panel. 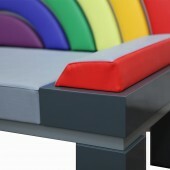 Colored prismatic upholstery elements are singularly realized in imitation leather filled with polyurethane. These are fixed to the structure via screws and metal bushing embedded within the rigid support. Colored elements are spaced one from the other with a low relief gap. The seat is made of glossy lacquered honeycomb wood structure while legs are made of solid wood. Backrest and seat are connected through a simple rigid joint. Sofa dimensions: width 1620mm; depth 690mm; height 1080mm. Backrest: depth 25 mm. Low relief gaps: width 18mm ; depth 35mm. Legs: width 135mm; depth 135mm; height 270mm Cushions: width 570mm; depth 540mm ; height 100mm. Transport can be made with three boxes only: 1.Backrest; 2.Base, seat and cushions; 3.Legs and armrest. Assembling does not require any specialized worker nor special equipment. Living in an area where there are no companies specialized in the production of upholstered furniture, the design phase mostly covered the constructive aspect. Simple solutions had to be found in order to avoid the use of sophisticated equipments. The main constructive challenge was to produce the backrest only using only a sewing machine with a single needle and a air nail gun. 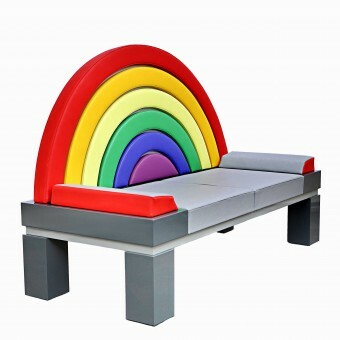 Sofa Rainbow Two Place Sofa by Francesco Perdichizzi is a Nominee in Furniture, Decorative Items and Homeware Design Category. · Click here to register today inorder to be able to view the profile and other works by Francesco Perdichizzi when results are announced. Sofa Rainbow Two Place Sofa by Francesco Perdichizzi is Runner-up for A' Design Award in Furniture, Decorative Items and Homeware Design Category, 2012 - 2013. 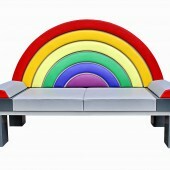 · Read the interview with designer Francesco Perdichizzi for design Sofa Rainbow here. · Press Members: Login or Register to request an exclusive interview with Francesco Perdichizzi. · Click here to register inorder to view the profile and other works by Francesco Perdichizzi.